Planning, coordinating, and executing a group trip takes a lot of energy from the group travel planner. The group travel planner sacrifices their time and resources to ensure everyone else has the best possible experience. However, this can often leave the organizers themselves too worn out, frazzled, or distracted to enjoy the trip themselves. These tips help group travel planner keep everything in order while still enjoying activities with the rest of the group. Volunteering to be a group travel planner does not mean you have to do it all alone. Enlist help from your fellow travelers to alleviate some of the stress. Find a co-captain. This second-in-command is there to help you field phone calls and information requests, keep details in line, and serve as a back-up if you can’t fulfill your duties. Divide large groups into smaller units of 3 or 4 people. Designate one member of each group as their central contact point. That way if someone is lost or needs assistance, they should call or text their group contact. Encourage individual responsibility. Provide travelers with a list of suggested and necessary items, deadlines, and other vital information well in advance of the travel date. Keeping the lines of communication open is an important part of achieving a smooth and stress-free trip. Use social media as a central contact point. Post important information, answer questions, and share pictures that get everyone pumped for the event. Keep your group text list updated. As individual plans change, add or delete members promptly from your list. Do everything digitally. Using emails and online messaging boards ensures important details are always accessible. The best way to avoid stress on your vacation is to get someone else to handle your duties as group travel planner! 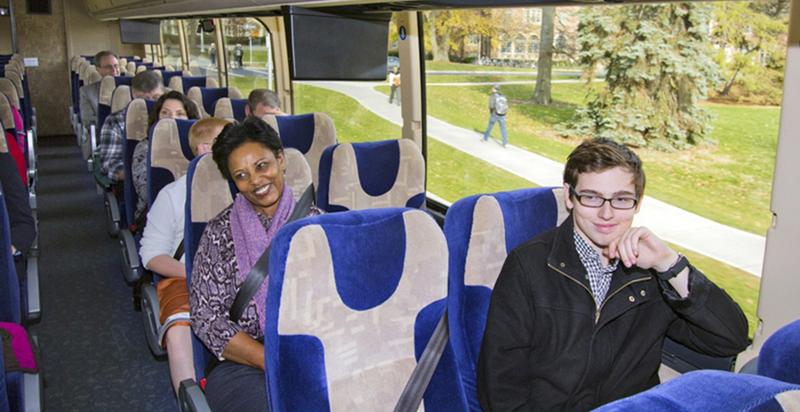 Rent a charter bus with a professional coach operator to avoid travel-related frustrations. That way you’ll get to spend your travel time hanging out with your travel mates . Book an all-inclusive resort package that includes hotel accommodations and meals. You’ll spend less time on the phone arguing over group discounts with various vendors. Work with a travel planner. The additional fees may be well worth the decrease in demands. Your group trip shouldn’t feel like work. With these tips, you gain precious time that can be used enjoying the experience with your friends. Put the fun back in your travel plans with these quick tips for group travel organizers. Use these tips to make sure group travel planners don’t miss any of the fun on your next group trip.